Bangli Regency is located precisely in the central part of Bali province, is one of the eight regencies in Bali that has no coastal areas. Its neighbouring regions are the Regional Government of Buleleng in the North, Klukung and Karangasem in the East, Gianyar and Klukung in the South, whereas Badung and Gianyar in the West. In this northen part located Kintamani a renowm tourism resort all over the world with Mount and lake Batur. In the southern part of this regions stretches a broad plain which laying about 100 meters above sea level most of them are rice fields. Bangli Regency has land areas of 520,81 square kilometers, administratively consisted of 187 community group (banjar), 69 administrative / traditional villages and 4 districts namely : Bangli, Susut, Tembuku and Kintamani. Bangli Has tropical climate so that it has two different seasons namely wet season last from Oktober till April and dry season from April to Oktober. The temperatures is 28oC. rainfall average between 1500mm3 up to 3000mm3 and the thickest can be seen in the western part of this region. The average humidity is 79%. From December to February the wind blows from west to east while from June to August it blows from east to southeast. The population mainly life is on agriculture with rice as a staple food. The other crops are sosonut, bean, cassava, coffe, tropical fruit such as oranges, mangos, salak, durian, bananas and many others. Almost 95% of the population are Hindu, is to reach peace and harmony of life guided by the Wedas as Holy Scraptures. There are also two ways to get there from this route. 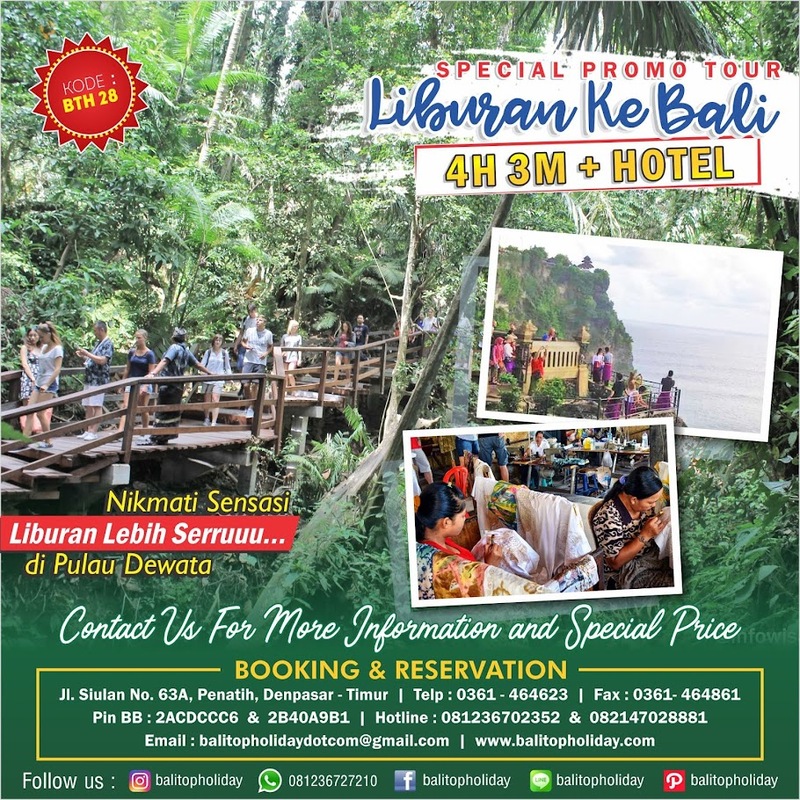 -Firstly, trough Denpasar – Kintamani, passing Batubulan station, Celuk, Sukawati, Ubud, goa Gajah, Tampak Siring and Kayuambua is the first village we come to Bangli Regency. -Secondly. 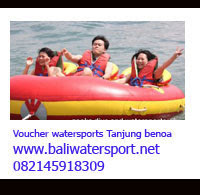 Trough Denpasar – Bangli route, passing batubulan, Sukawati, gianyar, Guliang, Taman Bali and arrive in town of Bangli. Many public transportation ply trough this route, start from Batubulan station (Gianyar Regency) and take about 1 hour drive. II.From Nothern Side (From Buleleng Regency). There are many public transport ply this route, start from Kampung Tinggi Bus Station Singaraja through Kintamani. III.From Eastern Side (from Karangasem Regency). -Firstly, from Besakih to Menanga village and arrive at Suter Village. In the northern side of this villageone can enjoy beautiful view of Mount and Lake Batur. -Secondly, from Besakih trough Rendang Village and arrived at Bangbang village. Place of interest worth visiting here are a cape and Puser Jagat Temple with 15th century statues. IV.From Southern Side (from Gianyar and Klungkung Regency). Passing Sidan village and arrive at bunutin, the first village we come to Bangli Regency. Public transports are very easy to get and they ply from early in the morning till evening. There is however,alternative route how to get to Bangli that is from Bitra Village to the north we will arrive at Kayuambua and trought a head to the north we will arrive at Kintamani, at Kayuambua take the southern road that lead to Bangli. The temple faced west ward where mount Batur and remains of its solidified black laves serve as backdrop and lake Batur stretches far down the slope, enchased the beauty to nature around the temple. Formerly, before it is in its present location Batur temple is located on the south western slope of mount Batur. 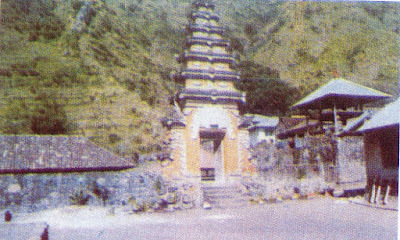 Since the devastating eruption in 1917 which destroyed everything, including the temple its self, then initiated by the head of the village along with other prominent figures, they brought the surviving shrines with them and rebuilt Batur temple to the higher place at Kalanganyar on its present location. In 1927,the people of Batur began rebuilding Pura Ulun Danu, the temple which once lay at the foot of the volcano. It was an ambitious project. The majority of the 285 planned shrines are yet to be completed. At present, the temple is finely and simply designed. Two august gateways, severe in contrast to the elaborate split gates of South Bali, open onto spacious courtyards laid with black gravel. Rows of meru towers silhouette against the sky in full view of the smoking volcano. The bale gedong, a storehouse of precious relics, contains a bell of solid gold. As the story goes, the bell was presented to the treasury of the temple by a king of Singaraja in atonement for his having insulted the deities. The ritual in this temple is closely linked with the veneration of Lake Batur and supplication for the blessing of irrigation water. The mountain, lakes help regulate the flow of water to he fields find villages through the many natural springs lower down the slopes. 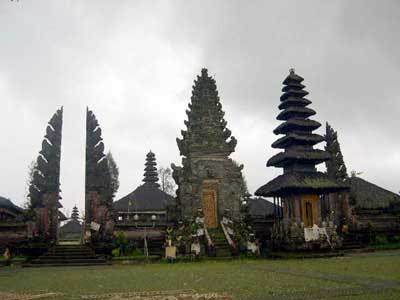 Kehen Temple is one of ancients temples in Bali where were housed three old bronze-made manuscripts. This temple is worshipped by the people around of the village. The ceremony takes place on 'Buda Kliwon Shinta' where Ngusaba ceremony is held one in a three years period, which is fall on 'Purnama Kelima' around November This place can be reached by any mode of transports through a well keptashalted road, or a short walk from Sasana Budaya Giri Kusuma Cultural Hall. The word "Kehen is drived from 'Keren"meaning flame. Formerly, it was known as "Hyang Api' Kehen Temple is located on the southern slope of Bangli Hill about 2 kms from the town. It is really an historical temple worth visiting with a long plight of steps pointing down to the south. This village can be reached through roads connect¬ing district of Bangli with Kintamani. From Bangli townto the north up to Kubu Village about 5 kilometers, then have a left turn, one will arrive at Penglipuran and will be received with warm welcome by the villagers. The air is fresh because it is located at 700 meters abo ve sea level. From hrstorical point of view, according to the village elders, the words Penglipuran' is drived from the words 'Pengeling Pura'means a holy place for remembering their ancestors. It is reasonable since their ancestors came from Bayung Gede village, still In Kintamani district. Since from Bayung Gede to Penglipuran is quite along distance there fore the people of Penglipuran, established the same temple as the temple In Bayung Gede. We can drow conclusion from this matter that the people of Penglipuran is still remembering their origin. Another opinion stated that Penglipuran'is derived from the word Penglipuran'means 'relaxation'since on the royal period this place was a good spot for resting place.This village has cultural potency which is up to the present time still well preserved in the from of tradi¬tional Balinese buildings; which differentiate this village from others.The population is 743 person, most of them are farmers and just few as civil servants. Dances and handi¬crafts are well developed in this remote village. This monument is located in the Southern part of Penglipuran Village, on an area of 1,5 hectare in Ba¬linese style equipped with Curayudha Building, a court¬yard for a certain activities, and parking area. It was built in 1959 in memory ofRevolution struggle in the Regency of Bali, commanded by Captain Anak Agung Anom Muditha with his 18 troops. The monument was built for remembering Captain Anak Agung Anom Muditha and his troops who are dead in facing NICA (Dutch troops) out during the revolution era. Penelokan (look- out point) is situated on the southern part of Batur Tengah village, Kintamani Dis¬trict about 23 kms from the Bangli town or 63 km from Denpasar, capital city of Bali province.The entire Batur area, with its spectacular scenery, belongs to the district of Kintamani in northern Bangli, The Pene%kan ( Look-Out Point ) offers views of Mt. Batur and Lake Batur, highlighting most tourist's visit to Bali. A t about 900 meters abo ve sea level, this vista point is cool and refreshing throughout the year with tem¬peratures a veraging 2-2'C at mid-day and 16'C at night. Pene%kan is just 27 kilometers from Denpasar is well maintained asphalted roads. Many visitors, both Domestic or Foreign, drop over to this resort, breathe the cool and refreshing moun¬tainous air and all at once to enjoy the breath-taking beauty of panoramic view with its solidified black lavas serve as a deaf witness to the 1917 eruption which dev¬astating entire villages sorrounding it. Meanwhile for those who like 'adventuring' could go for hiking up to the peak. The beauty of this caldera or crater really beggars description. Inspite of its beautiful panoramic view, we can also take a look the beauty of lake Batur with its crystal - clear water and mountainous areas serve as the unique graveyard and the Barong Brutuk of Trunyan village - which can't be found anywhere else in Bali. Kedisan village is located on the southem bank of Mount Batur, 7 kms from Penelokan and belongs to Kintamani district or 27 kms on the northern regency of Bangli. An idyllic little village, cool and refreshing air and hospitable people along with other villages such as Batur Buahan, Trunyan, and Songan village is called Bintang Danu village because of their location on the banks of Mount Batur. It has its own dockyard where one can hire a boat to visit the unique village of Trunyan. The cost of around trip-tickets and its schedules have been set by the LLASDP. The name of Terunyan is derived from the word “Taru” and “Menyan”; the smell of a fragnant tree of incense which grows in that village. The village consider that the tree is very important because the corpses of the dead person are just laid down on the open grave under the tree and left the face open; where as their bodies are simply covered by white clothes and by “ancak saji”. This method of burying corpses is called “Mepasah”. 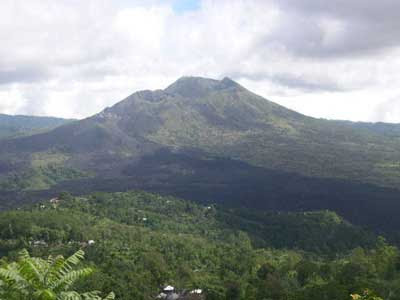 The village of Terunyan lays on the banl of lake Batur or on the west foot of Abang hill of Kintamani District. 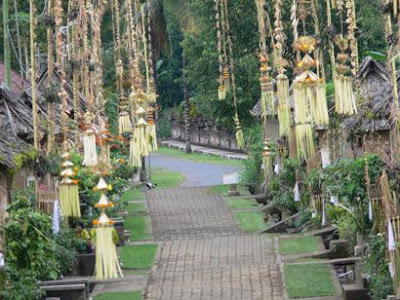 It is a village inhabited by the 'Origines' of Bali Aga with its unique cultural aspects. This village is attainable only by boat from Kedisan village, crossing along lake Batur in 30 minutes. Pengotan Village is another unique village besides the traditional village of Penglipuran. It offers plenty uniqueness, which are different to those owned by Penglipuran. The people have a different socio-life. Their houses are arranged in unique patterns and made of bamboos. Traditional arts also evolve well here, with arts like BarisJangkang, SarisJojor, Barls Perasi, Bans Perancak, Barls Blongsong, Barls Bajra, Barls Juntal, and Barls Dapdap Dance. The dances are often performed at the village temples. The so-called Perang Papah Is a unique tradition where performers hit each other using the stems of banana leaves . It is performed at Pedunungan Temple on Balinese calendar of Purnama Sasih Kenem (around December). Mass marriage is another uniqueness owned by the village. 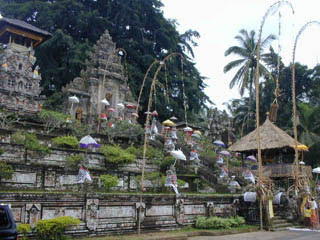 In this ritual, many couples are doing their wedding rituals together, which are held at their Penataran Agung Temple. These event is conducted a Sasih Kadasa (around April-October). 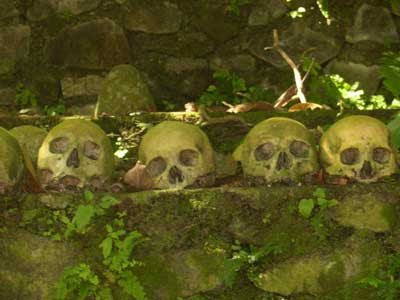 The other different tradition worth knowing is the burial ritual. The corpse is carried by two people to the cemetery, running. Arriving at the place, the corpse's cover is unveiled, making It naked. Then It Is rolled down into the hole for burying that has been prepared. Afterward, itis covered, face up-down-ward, overlooking northwestward. The Temple of Pancering lagat is located at Trunyan village, Kintamani District. The name of the temple is derived from the megalithic statue with 4 meters high, locally known as Arca da Tonta or Ratu Gede Pusering jagat among the common people. The ceremony in this temple takes place on purnamaning sasih kapat around October. On the same occasion the Barong Brutuk dance is performed for commemorating the legendary wedding anniversary between Ratu Sakti Pancering Jagat; the patron guardian of the village and Ratu Ayu Dalem Pingit (Ratu Ayu Dalem Dasar ). This temple is worshipped only by the people of Trunyan. 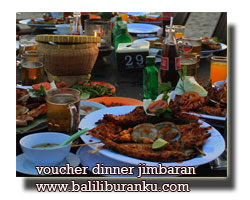 Eco Tourism Bukit Bangli is located about 1 Kms from central of Bangli City. It can be reach through the street which connect the Bangli city and Kintamani Tourism object. This object is developing tourism object because of it beauty, various kinds of flora and fauna from the top of the hill we can enjoy the beautiful, scenery of Bangli City and surrounding. The place is also good for meditation, tracking and clambing activities the northen side is supported by the Hindu education centre that support the Eco Tourism Bukit Bangli. Pucak Penulisan Temple is situated at 1745 meters above sea level about 3 kms from Kintamani, or 30 kms from the capital town of Bangli regency, on the east side of the road leading to Denpasar or Singaraja. Based on the old-Balinese manuscripts, it was told that Bukit Penulisan is also called Bukit Tunggal since its location is separated from the chain of mountains, stretching along from west to east, dividing Bali island into 2 parts, the northern and southern Bali. Around IX century on the peak of this Bukit Penulisan, the temple of Tegeh Koripan was constructed which is commonly called Pura Pucak Penulisan because it is located at the peak of Penulisan Hill. The temple of Puncak Penulisan, beside its location on a hill, composed of several terraces, even up to 11 terraces. These terraces reveal the continuation of the pyramidal from of cultural aspects of the megalithic age. Its is also a complexes respectively called Pura Danu and Pura Taman Danu, located on the third called Pura Ratu Penyarikan, located on the 4th terrace also on the west part of the temple. The 4th complex, Pura Ratu Daha Tua, is located at the west side on the 1611 terrace. The last or the fifth complex is Pura Panarajon situated on the eastside of the peak. This complex is the highest one compared to the four former complexes. Inside of this temple complex, visitors can find stone made statues and are believed to be derived from olden Balinese period as the remains of the megalithic culture. The forest is situated at Kubu V1llage, about 5 Kms from the town and 700 Meters above sea level, just a short walk from Penglipuran Village to the North. A cool and fresh air, also the unique sound of the bamboo whenever they touching each other.